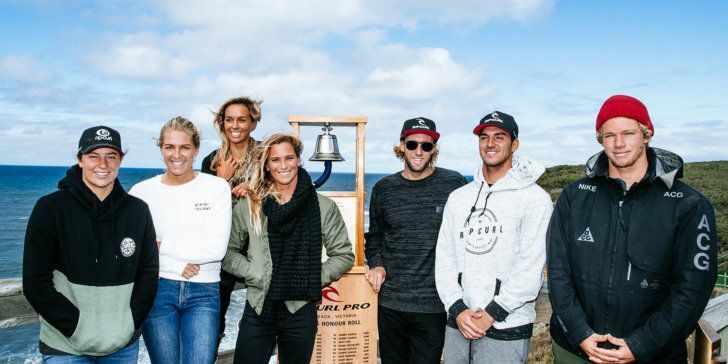 (Left to Right) Tyler Wright (AUS), Stephanie Gilmore (AUS), Sally Fitzgibbons (AUS), Courtney Conlogue (USA), Matt Wilkinson (AUS), Gabriel Medina (BRA) and John John Florence (HAW) are gearing up for the Rip Curl Pro Bells Beach. BELLS BEACH, Victoria/AUS (Tuesday, April 11, 2017) – The Rip Curl Pro Bells Beach, the third stop on the World Surf League (WSL) Championship Tour (CT), begins tomorrow with a competitive window of April 12 – 24, 2017. The longest-running professional surfing contest in the world, the Rip Curl Pro Bells Beach, has taken place each year since 1962. This year’s 56th iteration will witness a competitive field of elite surfers battle to prove themselves and earn the right to ‘ring the bell’. Current WSL Champion and World No. 1 John John Florence (HAW) leads the WSL Jeep Leaderboard for the men after securing a major victory at the Drug Aware Margaret River Pro and Semifinal berth at the Quiksilver Pro Gold Coast. Florence will look to surpass last year’s 13th place finish as he comes up against Jeremy Flores (FRA) and Visit Victoria Trials winner Glyndyn Ringrose (AUS) in Round 1. Six-time WSL Champion Stephanie Gilmore (AUS) and 2017 World Title contender Sally Fitzgibbons (AUS) currently share the top spot on the Jeep Leaderboard. Both have secured multiple wins at this event, but a victory to close out the Australian leg will be critical to this year’s World Title race. Gilmore will face 2016 Rookie of the Year Keely Andrew (AUS) and injury replacement Isabella Nichols (AUS) in Round 1 Heat 4. Round 1 Heat 5 will see Fitzgibbons face World No. 7 Lakey Peterson (USA) and World No. 15 Pauline Ado (BRA). 2016 WSL Champion Tyler Wright (AUS) is currently ranked third in the world and will look to surpass last year’s runner-up finish at this event. Wright will match up against Laura Enever (AUS) and trials winner Ella Williams (NZL) in Round 1 Heat 3 when competition gets underway. 2016 event winners Matt Wilkinson (AUS) and Courtney Conlogue (USA) will look to defend their event titles this year. Wilkinson, current World No. 6, is out for a strong result in Victoria after an early exit in Margaret River. He will come up against three-time WSL Champion Mick Fanning (AUS) and Jadson Andre (BRA) in Heat 1. Conlogue will battle to break through to the Semifinals for the first time this season, but will first need to defeat Sage Erickson (USA) and Coco Ho (HAW) in her Round 1 match-up. With a number of Australian and Rip Curl Junior events running at Bells Beach beach over the years, current World No. 2 Owen Wright (AUS) is no stranger the big open walls of the Bells Bowl. After missing last year’s event, Wright is back in familiar surroundings and is keen to display the power that comes with experience. With a first and an equal fifth from his first two events back on the CT, Wright will no doubt be one to watch when he takes to the water at Bells. 2014 WSL Champion Gabriel Medina (BRA) is eager to improve his standing on the Jeep Leaderboard at this event. Currently ranked eighth, Medina has had inconsistent finishes thus far on the Australian leg. Round 1 will see Medina battle Stuart Kennedy (AUS) and 2017 CT Rookie Leonardo Fioravanti (ITA) in Heat 3. Taking out the final two spots of the men’s draw were two competitors with very different experiences of the CT. Winning his way through the Rip Curl Trials was Samuel Pupo (BRA), whose older brother Miguel Pupo (BRA) has been competing on the CT for the better half of five years now. He will be joined by former CT competitor Glyndyn Ringrose (AUS) who took out the local Visit Victoria Trials. Ringrose overcame a hungry pack of local Victorian surfers to find himself back in a CT event for the first time since 2001. Italo Ferreira (BRA) has withdrawn from the Drug Aware Margaret River Pro after an ankle injury suffered earlier this year. Ferreira’s position has been filled by Nat Young (USA). Event organizers will convene tomorrow morning at 6:45 a.m. to assess the conditions and make the first call. 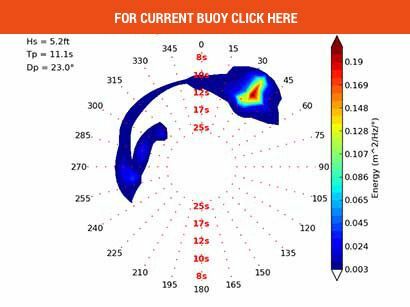 The first half of the waiting period has several potential swells: medium size SW swell on Wednesday, fades Thursday. Back-to-back SW swells are possible from Friday afternoon through Sun/Mon that, at this point, look roughly similar in size. 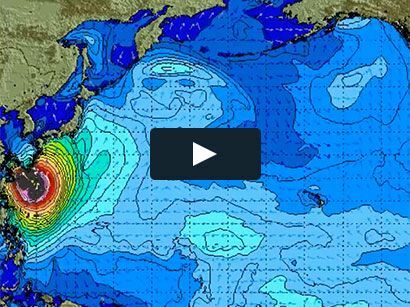 There is potential for a larger and possibly solid SW/SSW swell for Tue-Thur the 18th-20th. Surfline.